Recently, I had a weekend with no cakes booked, so that meant it was time for a VACATION!! Now normally, I’m the structured, organized one, but when it comes to vacation time, I get all willy-nilly. So late Saturday night Chad and I got online and started looking. We eventually narrowed down our choices to Memphis or Charleston. A coin flip later and it was decided… we were going to Charleston!! The adventures start after the jump! Being the foodies that we are, we decided to chronicle our culinary adventures and what we thought about each place where we dined. 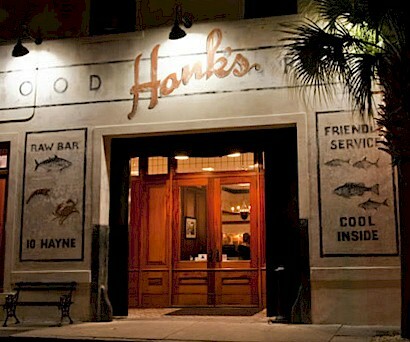 First I have to say that the food at Hanks was really good. We both had seafood and you could tell that it was really really fresh. Chad had the tuna medallions and they were cooked perfectly and had a creamy buttery texture. I had the blackened grouper with risotto. The grouper was really good, but the risotto was a little off. I expect a risotto to be rich and creamy and this just… wasn’t. Our biggest problem with Hank’s was that the prices were high, but the portions were on the small side. Luckily, since it was so late we weren’t terribly hungry. Dixie Supply is the quintessential hole-in-the-wall restaurant (next to a convenience store if I remember). This place is very small, and the service was a little slow, but the food here was amazing. Chad had a “Shrimp, Bacon, Lettuce, and Fried-Green-Tomato Sandwich”. His comment: “I can never go back to regular BLTs again!” I had the peach stuffed French toast and it was good too. The peaches were really fresh. The prices were great too! 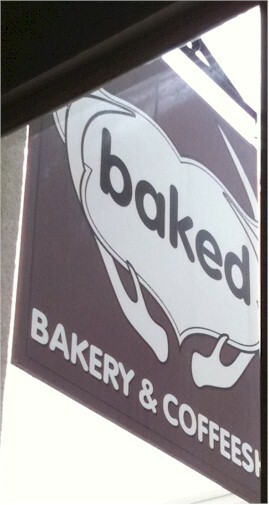 Now I have had the baked cookbook Baked: New Frontiers in Baking for a while, so I couldn’t wait to try their pastries. We both got a cupcake and a pastry and they were really good. We even loved the decor of the place. The walls were stacked with pieces of crown molding that ran from floor to ceiling. It gave this really cool stripey feel. The highlight of this trip was the key lime tart. 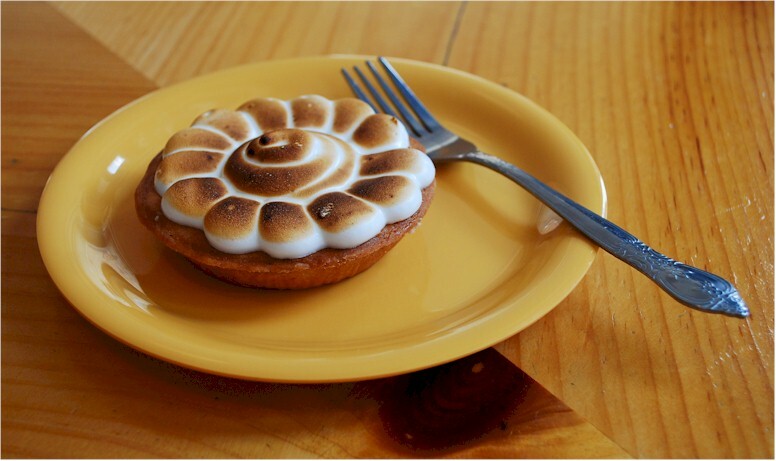 It was very artfully topped with marshmallow and then torched. It really brought out the piping design. See? This is one of those places that I WISHED we had around home. It was really like a mini market that indeed carried everything from caviar to bananas. They sold a lot of ready to eat salads and foods, but we decided to try a meat and cheese sampler. There was manchego and parm with honey as well as cappacola and proscuitto. It was really much than we bargained for, but it was excellent. When I say we were running late, we were late. Jack’s closes at 8:00 and we ran through the door at about 7:53. Even though they were cleaning up, the staff was gracious enough to let us in and make us dinner. I had a Cosmic Dog and Chad had an Atomic Dog. Both had blue cheese slaw (YUM!) 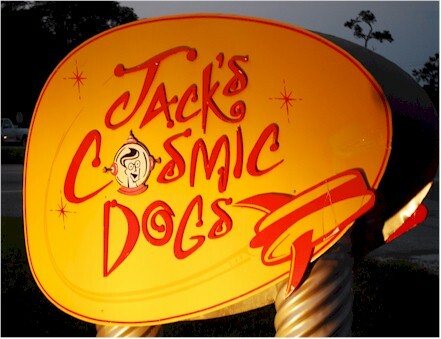 but the atomic dog also had chili and cheese. We shared an order of fries, which were cut very thin, but in a good way! We hurriedly ate our meal and thanked the staff for staying late just for us. 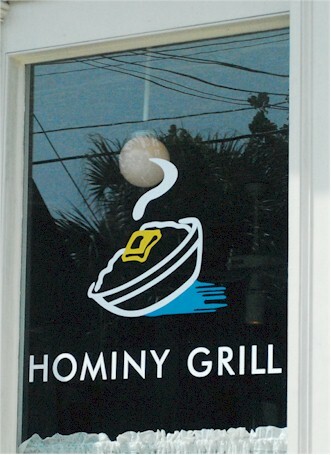 Day two’s breakfast started out at the Hominy Grill. This was a great place for breakfast, and they had parking too (a rarity in Charleston)! The staff were super friendly too!! I had the shrimp and grits and while they aren’t my favorite (more on that later) they were still very good. Next we stopped at Cupcake, for well, a cupcake. I loved this place, it was SO cute! They had done a great job with branding. Cupcakes were good too! WOW! This post is running very long, so if you want to hear how everything else turned out, join in next time!